Approximately three percent of the school-age population was homeschooled in the 2011–12 school year. Among children who were homeschooled, a higher percentage were White (68 percent) than Black (8 percent), Hispanic (15 percent), or Asian or Pacific Islander (4 percent) (table 7). One reason the numbers could be lower is the Center changed its methodology. It used a mail survey this time instead of the telephone survey used in 2007. When discussing this with a homeschooler he mentioned that most homeschoolers he knows, including himself, “would not respond to government forms unless it is clearly required by law. They believe that the less contact with the “authorities” the better when dealing with matters like this.” I think he may have a point; certainly the change in methodology makes it difficult to compare previous studies to this one, which the authors acknowledge in the report. The reasons why people homeschool are also noted in this study, as they were in previous studies; I reproduce the actual tables for numbers and reasons below. Of note is that around 5% cited “A desire to provide a nontraditional approach to child’s education,” but the authors caution this an uncertain number. However, when put it in perspective with all the other reasons cited below, one can say that an overall reason people homeschool is because they don’t want their children to be hurt intellectually, physically, or spiritually by school. Number and Percentage of Homeschooled Children in the United States, 2011 to 2012. 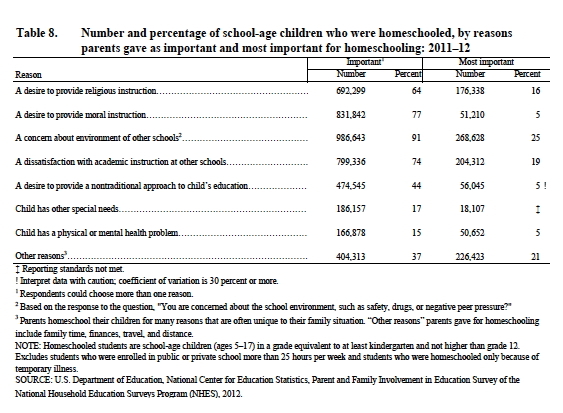 Reasons Why Parents Homeschooled Their Children, 2011 to 2012.